I remember Saint Luke’s Lutheran Church very well. I recall worship, and Sunday School, and Catechism (as we used to call Confirmation class), and yes, I remember potlucks. My parents took me to that church in Springfield, Ohio, and there, I heard the Word of God as it was read, proclaimed, sung, taught, and even tasted in Holy Communion. I also heard it on the printed page, for that was where I began to read the Bible roughly fifty years ago. Faith does not come out of nowhere. 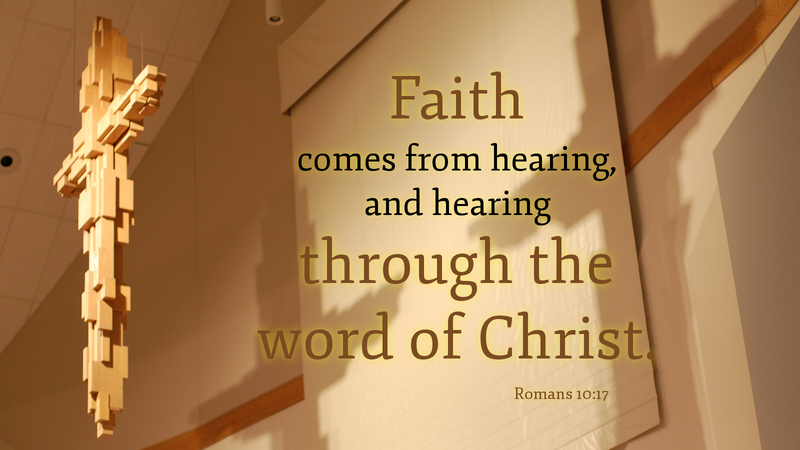 It comes by the action of the Holy Spirit through the Word of God. I owe a great debt to those pastors, teachers, and parents whom God sent to share his Word on the corner of North and Race Streets. May we also send out that Word that will never pass away, for the Son of Man is very near. We owe it to God and to people everywhere to preach his condemning law and merciful grace. How else will people hear and believe, if we do not send them preachers? May the voice of Christ’s Church go out to all the earth, and may the going begin with you and me. Prayer: Lord, help me to die, pointing to the promised land. Amen.